Safe operation of a pressure washer sewer jetter attachment starts with reading and following your pressure washer safety instructions, but it doesn’t end there. Sewer jetters operate inside dirty drains where potentially harmful bacteria reside. Sewer jetter nozzles are attached to a flexible hose and so can’t be reliably aimed or controlled if accidentally operated outside of a drain pipe. 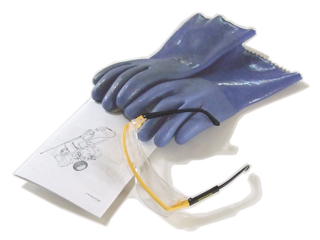 Beyond the common-sense precautions of wearing fluid-resistant work gloves and eye protection, there are additional steps needed to operate your jetter safely. Do not start the flow of water until the sewer jetter nozzle is more than a foot inside the cleanout opening to avoid being injured by the high-pressure water stream. When removing the sewer jetter from the drain after the job, use care to stop the flow of water long before the nozzle reaches the cleanout opening. Use sewer jetters only in well-ventilated areas and avoid breathing spray mist from dirty drain pipes. Don’t use a sewer jetter in pipes that contain chemical cleaners to avoid burns from the caustic fluid. If you buy a good-quality, ready-to-use sewer jetter you’ll find a summary of important safety information inside the package.